Starting last week, former Guatemalan dictator Efrain Rios Montt has been on trial in his country for charges of genocide against the people of Guatemala, particularly the Mayan people. This trial is significant on lots of levels. First, it is significant for the Guatemalans who have been organizing and demanding for years that Montt be held accountable for his crimes against the Guatemalan people while he was ruler of the country for roughly 18 months in the early 1980s. Montt, after taking power in a military coup, disbanded the Guatemalan constitution and continued a campaign of terror against Guatemalan civil society that had been going on in varying degrees since the CIA coup of 1954. However, under Montt, the brutality was taken to another level and the Mayan population was targeted by genocidal policies that resulted in tens of thousands being killed during Montt’s short time in the National Palace. The charges against Montt are well documented by numerous Guatemalan Human Rights groups like Grupo Apoyo de Mutuo and the National Security Archives, which has been collecting declassified documents from the US and Guatemala that relate to political violence since 1954. The National Security Archive has a great deal of these documents along with analysis that can be found here. The trial of Efrain Rios Montt is also significant for the US, since Montt was considered an ally by the US government, particularly the Reagan administration. The Reagan administration provided financial & military support for Montt’s regime, thus making the US complicit in the genocidal policies committed at that time. Sectors of the religious community in the US are also to blame for these crimes, as Montt had converted to evangelical Christianity in the mid – 70s and worked closely with US evangelicals, particularly a group from California called the Church of the Word. This relationship is detailed in the book, Terror in the Land of the Holy Spirit: Guatemala Under General Efrain Rios Montt 1982-1983, written by Virginia Garrard-Burnett. Montt’s own theological views contributed to his military policies. Montt believed that the Mayan were possessed by demons and said that when the military was slaughtering them they were not killing people, but demons. Lastly, the trial of Efrain Rios Montt is significant for people in West Michigan, because West Michigan is home to thousands of Guatemalans who have migrated to this part of the country in large numbers as a result of the political violence and economic exploitation perpetrates by Montt and other government leaders in Guatemala. I know this personally, having been part of the US Sanctuary Movement in the 1980s, where we hosted several families from the Huehuetenago region of Guatemala. 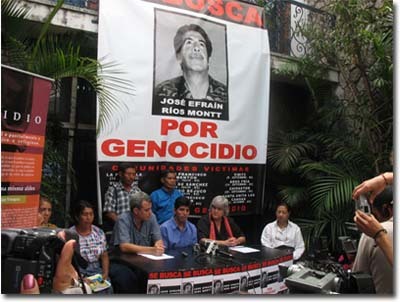 These political refugees fled the scorched-earth policies of the Montt regime, which had resulted in the murder, disappearance and torture of thousands of Guatemalans. Following this trial is important, because it not only forces us to come to terms with why so many Guatemalans have come to West Michigan, it also provides the possibility of some political and psychological relief to Guatemalans who still live in fear of speaking out about what happened in the genocidal years. If Montt is found guilty and justice is served in some way, imagine how important this will be to the Guatemalan people and the possibilities for systemic change in the future. For those wanting to follow the trial of Efrain Rios Montt, check out http://www.riosmontt-trial.org/. Also, there will a screening of a recent documentary on the genocide charges against Montt, Granito, that will be shown on April 6th in Grand Rapids.